3D Head Creator. One-click 3D Head Export. Export Talking Scripts. 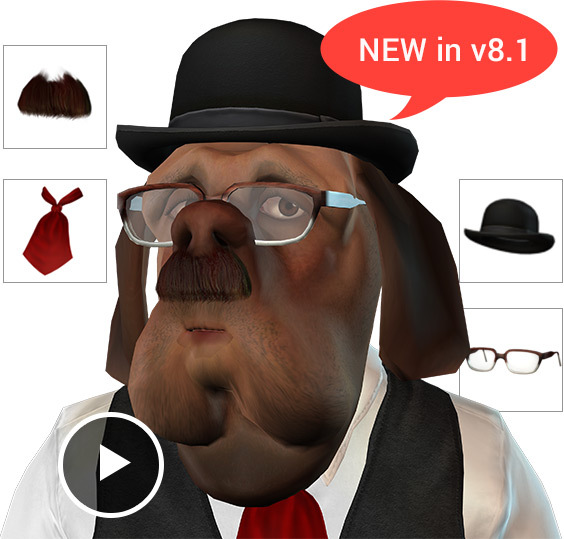 The powerful photo-to-3D-head technology in CrazyTalk 8 Pipeline provides iClone (v6.3 above), and Character Creator (v1.3 above), with the best solution for converting real-human photos or comic images into animated 3D heads. Also, not only can the 3D Head meshes and textures be exported to iClone and CC, but you can also edit and share the same talking scripts created by CrazyTalk 8 to iClone! 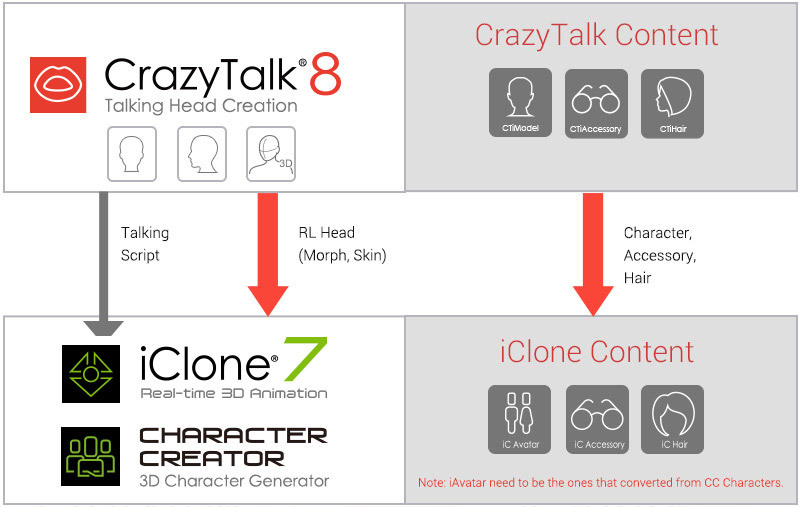 With the CrazyTalk 8.1 Pipeline you can bring in 3D characters, accessories, or hair, generated by iClone or Character Creator to enrich your talking avatars. If you like to create your own 3D assets from scratch, then you can take advantage of the CC/iClone pipeline as well. Once your 3D Head editing is complete, use the One-click option and send your 3D head and textures directly to Character Creator and iClone to create complete 3D avatar and full-body animations, or send them to any other 3D tools via 3DXchange Pipeline for a wide range of applications. Note: Once your Talking Scripts and/or 3D Heads are created, users can then export them to other 3rd party tools via FBX format. For this process you will need CrazyTalk 8 Pipeline, then go to iClone PRO, and finally convert to FBX with 3DXchange Pipeline version. Also, please take note that if you plan to export a copyright character from a content pack, then you will also need the export license for that particular character content pack.